For the record, there is little middle ground with me. I love something or I do not prefer it. So know that if you like the fonts on my ugly list we can still be friends. Although mocking may or may not be involved. Plus I am extremely fickle. Basically, I will have a passionate love affair with a font for about six months before kicking it to the curb. But today I like these fonts. my husband is on your team. He was horrified that I included it on my ugly list. I admit that there was a time that I liked it. Even used it quite a bit. I could barely read the subtitles on Avatar because the Papyrus-ness was so distracting. Enough about my strong opinions. Tell me your fave fonts. I am counting down the days for this beauty to be available for free. Until then, I am still searching for a new font boyfriend. i love the fonts on your font lists. i'm just like you. i despise papyrus. but, for now i'm crushin' on dearjoe4. I like Honey Script and Little Days but I'm not a big fan of porcelain. I love fonts too and usually gravitate towards what I call the Happy Ones for my personal use. Have to go with the ones I don't like for graphic design work--but beauty is in the eye of the beholder. And...I agree, Brush and Comic Sans are so totally yesterday. they'll come back in style 30 years from now! I like Calisto MT. It has Regular, Italics, Bold and Bold Italics. I love fonts with several weights. TOTALLY agreed on CURLz. bluahhgh. And Brush Script and Comic Sans. bluah again. I can handle Papyrus if used in the right setting the right way, but that is rare. Do you ever go to KevinandAmanda dot com... She has a TON of FREE handwriting fonts that are AMAZING... She even tells you how to download them! Bunches and Bunches of AWESOMENESS! Hands down, my favorite font is: Gessele from dafont.com; I use it every chance I get! I love the pharmacy one too!! i also LOVE henparty serif! I also love some that Amanda has on her blog .. you know the kevin a nd amanda one? MaSexy is also cool and swirly. It also depends how it looks when I type whatyever it is that I am typing ... on what font I wanna use. Oh my gosh... right there with you!! I wish I could afford Archer. I love that font, like more than a friend. Yes, yes gotta go to kevinandamanda.com and check out the peas fonts. awwww, snap...i was gonna say archer. it is pretty sweet, alas i will never pay for fontage. lately, i'm loving sans serif fonts; champagne & limosuines, castorgate, print clearly, etc. sleeker, more modern. but, going in a total opposite direction...i will always be a sucker for 'jane austen'. always. it is timeless. i love typewriter fonts, but feel like i'll hate them in, like, 7.5743 seconds. incidentally, curlz makes me have a fit. like my blood pressure goes through the roof, i get a blank stare on my face, and am pretty much unresponsive, except to chocolate. i can honestly say I HATE curlz. To the Curb: Bambino, Copperplate (ew. gross. ), Papyrus, Catts Hand & Joyful Juliana. Loving the Honey Script...hello, gorgeous! Ah yes, love archer. Would not love to pay for it. We're the same when it comes to little to no middle ground. It drives Tony nuts that I either love (love, love, love) something or hate it. Did you get haters on your ugly font post?? I recently fell in love with Vladimir script when used in combo with a more traditional font. (Like the header of my blog book design site) just a little goes a long way. At kevinandamanda(dot)com I am in live with Wish I Were Taller (the font for my blog titles), Lima Bean, and Pea Lovey Dovey. I actually love too many fonts to list, but those are my favorites that I know off of the top of my head. And, I LOVE archer. I am also waiting for it to go on sale for free! I fear you've given me font paralysis. I had no idea there was such strong feelings about fonts! How do you feel about using Bold or Italics? Is there a font support group you can attend, if you need to be weaned off a certain anti-social font such as Curlz appears to be? Can we now accuse people of being "Fontist", if they don't like our fonts? I think the Little Days one is just fabulous.. It may not be you... but I think it is great..
i am going to be boring and just say Helvetica or Arial. Verdana is also one of my favourites. not only does the font matter but also the size of the font. the Little Days font is very cute but i can see that being overused too if not used carefully :). and i can tell that you do to. so you HAVE to go to www.kevinandamanda.com/fonts and check out all of Amanda's uh-MAY-zing fonts. seriously. the girl is incredible! my all time favorite font is Digs My Heart by amanda. it's simply delightful. 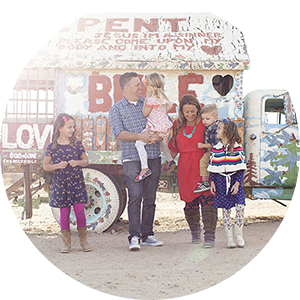 please go over, check out her fun blog, and gitcha some of that free font goodness! Ooo I really like that Archer. Love the Little Days font. Thanks for sharing that website! 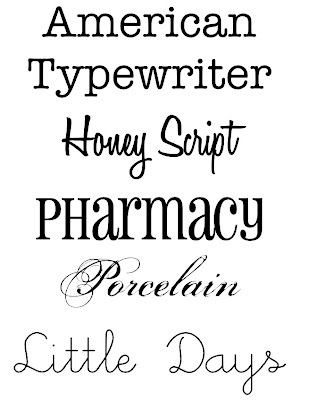 I'm definitely a font snob-- and pharmacy is one of my current faves. And I'm totally tired of curlz, but I'm a monogrammer and it's a really useful and popular font. Do you have a suggestion of another whimsical, girly font that's not too skinny? I'd also love a good, standard, pretty script-- so hard to find! Thanks for any help! Fonts Matter!!! I also love them all! I think this is so funny since I agreed on the fonts you dislike, that right now a friend of mine and myself are obsessed with the Pharmacy font. I mean, we have a serious crush on it. Cracks me us that it's one of your faves too. Thanks to your other commenters, I'm on my way to check out the other font site mentioned! All of this just cracks me up. So, my question for you is how do you get these fonts uploaded to blogger so I can use them on my blog? I have fun fonts on my computer, but I never get how to get them onto blogger. I know I am not the most computer savy person, but seriously, I don't get it. I'm with you on the previous list. I actually received a Christmas letter written in ALL Curlz! GASP! Can you believe it?! I could hardly read the darn thing. I love kevin and amandas "his name is honey" check it out! Love that pharmacy one too..may have to go grab it! Pharmacy is one of my all time faves! I also love "Cheri" "Grenouille" but they are more cutsie. My all time fave (and the one I use for my business materials) is "Loved By The King." Working for a youth pastor, I had a ton-o-fonts to work with for all of his weird projects he wanted. He used ugly ones like Big Truck and Goudy Stout. I had to use fonts that the boys wouldn't pass over because they were too pretty. I love love love papyrus. I used Californian and Poor Richard a lot. My fav right now is Complete in Him. Sooo funny. The first time I saw a trailer for Avatar, I said to Mark, "Papyrus? Are you kidding me?" And he was like, "Huh?" I can't find that American Typewriter on dafont.com YIKES! i am a total font snob! i find some tasty treats on urbanfonts(dot)com. i could spend ALL day downloading new fonts!!! have a super duper happy day! Yep. Papyrus is no good. but - Little Days & American Typewriter - LOVE. I also really like Pupcat, Honey Bunches, Wendy Medium, Learning Curve -- all of which I've gotten free. oh - and I check kevinandamanda.com for new fonts *everyday* -- yes. I told you I obsessed! I am so sorry I don't know how to link in a comment, but check out the link at the top. I read it and immediately thought of you! Way cuter than the dreaded Times New Roman! I've hated it for so long, but I never knew it was so easy to get such fun alternatives. What a great tip! which you may have seen elsewhere. My boyfriend is tired of hearing me curse Papyrus. Restaurant menus, moving trucks, I can't get away from it. I had it out for Comic Sans in college. Kindergarten teachers are the ONLY ones who should be allowed to use this. It should definitely not be allowed on a college (or grad class) syllabus.